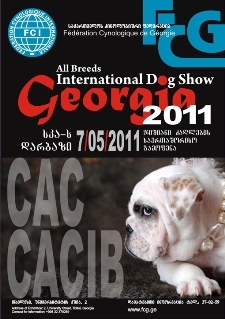 The International All Breeds Dog Show CAC-CACIB FCI "Georgia 2011" took place in Tbilisi on 7 May. The Show was organized by the Fédération Cynologique de Géorgie (FCG) and had a great success. Around 200 of dogs from different countries were registered for it. The ring judgement was conducted by International Experts Mr. Yuriy Gergel (Ukraine) and Mr. Zaza Omarov (Georgia).